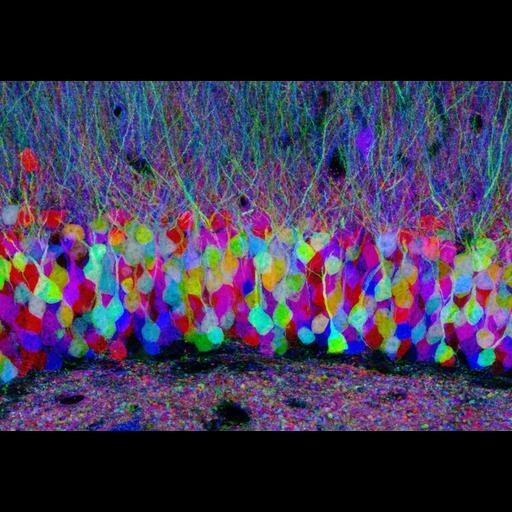 Confocal image of pastel neurons in the hippocampus of a "Brainbow" mouse brain, with each neuron expressing a distinct color. In Brainbow mice, neurons randomly choose combinations of red, yellow and cyan fluorescent proteins, so that they each glow a particular color. This provides a way to distinguish neighboring neurons and visualize brain circuits. Honorable Mention, 2007 Olympus BioScapes Digital Imaging Competition. For additional details see: Livet J, Weissman TA, Kang H, Draft RW, Lu J, Bennis RA, Sanes JR, Lichtman JW. Nature. 2007 Nov 1;450(7166):56-62.